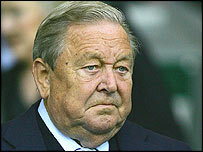 Uefa president Lennart Johansson has defended his controversial remarks about female footballers, insisting "I'm not a sexist". Johansson caused a stir by suggesting the women's game could benefit financially by promoting the image of "sweaty, lovely looking girls." But Johansson countered in The Times newspaper: "All I was saying is that women are more marketable than men. "I would never want to upset or criticise the women's game." The Swede had been quick to criticise Fifa president Sepp Blatter in January after he called for women to wear tighter shorts. However, Johansson stuck by his assertion that promoting the physical assets of female players was one way of promoting the sport. "The PR for the women's game could be done a little differently and they could benefit from that," said Johansson. "Even if women, like men, are playing a match and sweating and it's raining, when they come out of the dressing-room they are still ladies and they have different products that they can sell. "All I was saying is that the women's game must understand that they need sponsoring and publicity and positive results. "I'm not surprised my comments have been taken the wrong way. "I would have been best-advised not talking to the media."